Over the past 18 months we have been consulting with fans, staff, the owner and other stakeholders about our Club crest. Having heard a wide range of opinions we have made the decision to update it, and now we are excited to reveal our new Brentford FC Club crest to all of our fans. Why are we updating the crest? Although our current crest naturally means a lot to all Brentford fans, it also causes us challenges. There are two fundamental reasons why we are updating it. Firstly, its complicated design makes it impractical to use, particularly at small sizes. It was designed in 1993 before the digital revolution and does not replicate well in many online media and printed items. We regularly run into difficulties in these areas. Secondly, there are lots of elements in the design fighting for attention. This contributes to our crest not being nearly as recognisable as other clubs’ crests. In an independent survey of football fans we found our crest to be significantly less recognisable than other London teams - among national and local respondents. By solving these problems and introducing a much more iconic design, we believe that our new crest will strengthen our identity, help raise our profile and better demonstrate our status as an ambitious, forward-thinking Club. All of which are vital as we aim to build a sustainable future. While Middlesex is an important part of our history, the swords are not of primary importance today. The bees and hive illustration is cartoon-like and too detailed considering it takes up a small proportion of the crest. ‘Football Club’ font feels dated and is a different size to the ‘Founded 1889’ text. Although our crest has issues with practicality and recognition, updating it is not a decision we have taken lightly. Over the past 18 months we have engaged with the owner, a range of fans and stakeholders. We've undertaken one-on-one interviews and focus groups in order to understand everyone’s feelings towards the current crest and appetite for updating it. As we expected we heard a wide range of opinions, but the vast majority of people were not attached to the current crest, and many were in favour of change. The overarching brief for our new crest was to significantly simplify the design while ensuring that the new design truly represented who we are. Over the course of the process we looked at all our historical crests for inspiration, designed a range of options and whittled them down in conversations with fans and senior leadership. What became clear was that including a bee was vital, as it most directly communicates who we are. Everyone we spoke to agreed that it was important to include the year of our foundation in our new crest as the historic nature of the club is something we and the fans are rightly proud of. Our new crest solves all of the practical issues with our current crest and, as time goes on, we believe it will become far more recognisable too. 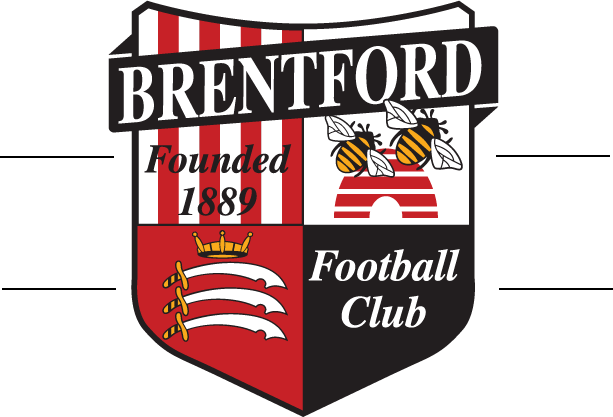 Historically our new crest draws most inspiration from the 1972-75 crest, and the 1960s Brentford Supporters Club badge. The bee at the centre of the roundel was specially commissioned. It is more angular and aggressive looking than any bee illustrations we have used down the years, which adds to the strength and character of the overall design. The typeface is clean and legible and the numbers of 1889 draw inspiration from historic football typography. The colours of the new crest mimic the red, black and yellow of the current design. Our new crest was the preferred choice of all internal stakeholders including our owner, from a final shortlist of three. A lot has changed since our current crest was designed in 1993. We have made great strides forward on and off the pitch, and now we have a Club crest that matches the quality of the football we are playing and our ambition for the future. Our new crest will be worn on our kit from the start of the 2017/18 season and will stay with us for the long-term. We hope you will all wear it with pride as we move forward into one of the most exciting periods in our history. “It's always an emotive subject when a club decides to change something as important as its crest but part of our club's philosophy has always been about moving with the times and improving as we go. Myself, the Board and the senior leadership team at the Club believe that's exactly what the change in the crest does. It's simple, it's iconic and it immediately tells the world who we are without even the need for words. Like everything we do at Brentford, this isn't change for change's sake, there is always a reason behind it and that reason is to give the club a clearer and more recognisable crest that will help us grow off the field. We all recognise the old crest wasn't really fit for purpose in a digital age where impact has to be instant and that's part of the reason we've changed. "I believe that the new crest shows off to good effect, without the complexity of our current logo, both our heritage and tradition. We are known as The Bees and the new badge reflects exactly that. It allows for instant recognition, and is one that I believe supporters both young and old will take to."